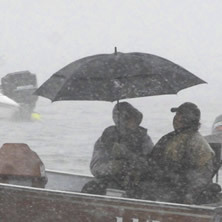 This epic fishing had to come to an end sometime, and all this weather is probably going to slow it down. The bass are a little deeper now and slowing down, so a jig/worm or a slow-rolled single-blade spinnerbait might do the trick. Crappie and bream are being found in the deepest parts of the creeks and bayous. And if you're wanting to mix things up, there are some great cat-fishing tips in this week's report. Specks have transitioned to the deeper areas, so the Theodore industrial canal or the deep spots of the lower-delta/rivers (Dog and Fowl) should be a good bet. Remember to fish SLOW.